Last Saturday, we decided to find something interesting to do that didn’t involve too much physical effort. I suggested we go to the Chattanooga Arboretum and Nature Center to see the Red Wolves. The Nature Center has one of the few red wolf breeding programs. We have been to the Nature Center a few times, but we’ve never seen the red wolves. I decided to take my DSLR with the 70-200mm lens, figuring we’d be pretty close to the wolves in their exhibit area, but I might need to zoom in. We took Tisen with us, although he’s not allowed in the nature center because it’s a wildlife preserve. We figured we wouldn’t be there very long and he could hang out in the car. Then, we’d take him somewhere he could get out and romp around a bit. I put my DSLR around my neck, my iPhone in my pocket, and grabbed my wallet when we arrived. We headed into the visitor’s center where we learned it would cost $10 each for our 20 minute visit to see the red wolves. We decided to buy an annual family membership–it was a much better deal. We headed down the boardwalk towards the Wildlife Wanderland exhibit. 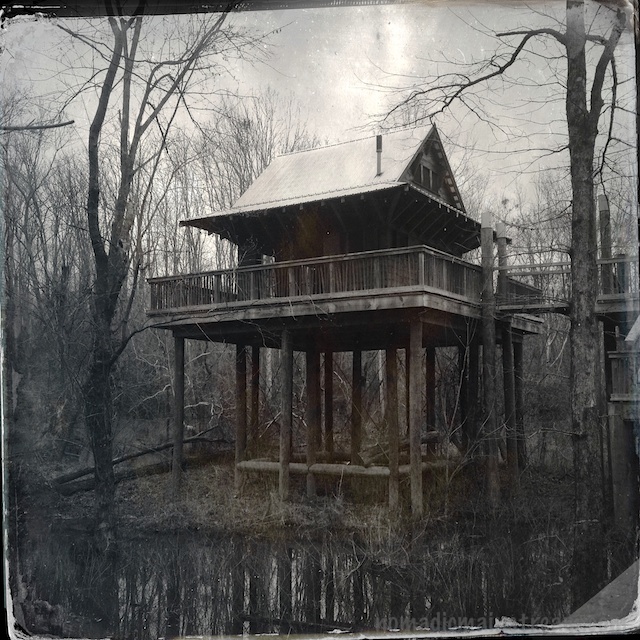 Along the way, we discovered a really cool treehouse on stilts in a wetland. Of course, my 70-200mm lens was too tight to get a good shot. 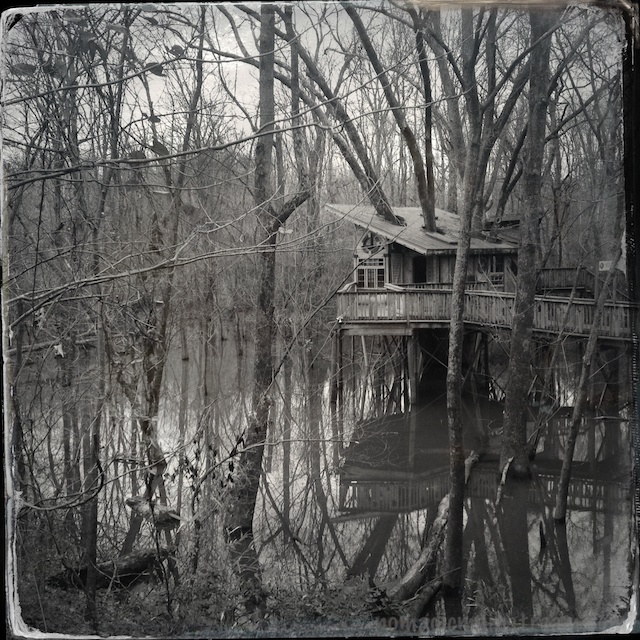 So, there I was, standing on the boardwalk with my expensive gear hanging around my neck while I used my iPhone to take Hipstamatic shots of the treehouse. It reminded me of a photo someone shared on Facebook of a professional photographer standing on a sidewalk with 3 cameras, extra lenses, and various other equipment hanging off of him holding up his iPhone to take a picture. 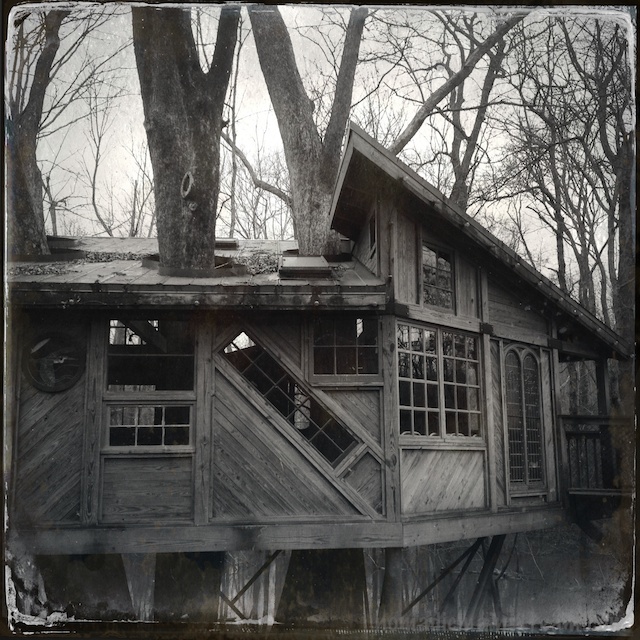 The treehouse made a good subject for the tintype effect because of its setting. But the contemporary angles of the roof, like the Tennessee Aquarium in earlier posts, create an anachronism in this old-fashioned style. After exploring the treehouse, we moved on down the boardwalk to the canoe launch. That was truly modern. They have a dock that has a mini-canal in the middle of it to make it easier to get in and out of the canoe. They also have a rack full of canoes–we’ll have to give those a try when the weather gets warmer. Next stop: red wolves. When we got to the junction leading to the Wildlife Wanderland, there was a chain across it with a “closed” sign hanging from it. I guess we’ll have to take advantage of our new membership to see the red wolves–at least we won’t have to pay $20 every time. When we returned to the car, Tisen was barking. This is rare. Usually he sits in the front seat and looks out the window quietly. I’m not sure what got him barking, but he was happy to see us. 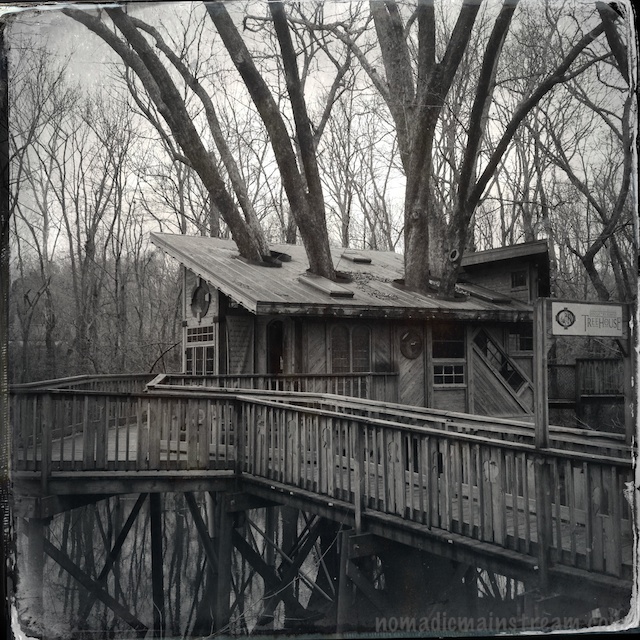 This entry was posted in Chattanooga, Dogs, Photography, Wildlife and tagged iPhone, iPhone Photography, Nature center, Red Wolves. Bookmark the permalink. My pleasure, those are interesting structures. Well done. The first time I ever saw a real tree house, interesting. I like to explore with you in your blog. It’s almost like beeing there. 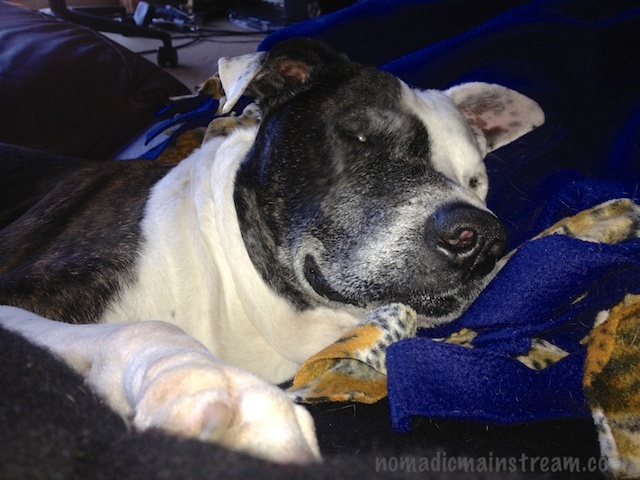 Maybe Tisen was thinking Red Wolves when he was barking.